And urban streets are not the ONLY places that get clogged up with double parked vans! University campuses, airports, business parks, amusement parks, shopping-mall loading docks... Think of all the areas that could use these for more effective delivery! More smaller vehicles costing less to operate could mean room for more employed drivers too!!! And why is it that customers from oil-producing countries like Saudi Arabia seem to be more serious about our electric-assist pedal cycles than North Americans? Is it because they question the notion, "there will never be an end to cheap oil"? Thankfully, there are many forward thinking people in all continents that want a part of what's soon to be...alternative vehicles less expensive to run, using ecologically sustainable power from renewable sources. 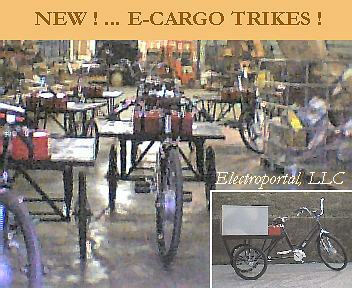 Besides the container of trikes sent to Saudi Arabia... we're electrifying existing trikes for a variety of applications. Another great candidate for our high power motor! 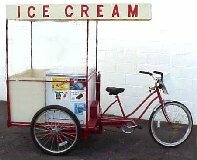 Use your imagination with the Ice-Cream trike...or ANY trike! 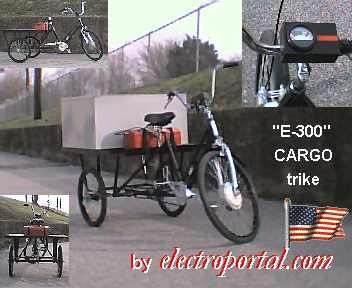 It can be a juice or coffee stand ("gourmet"...for those inclined)...an information "kiosk", a pedal cab...hay cart?? -- If we can't help you with your body style preference, surely someone else can!! Add some solar panels for longer range, stereo surround sound, electronic messaging...or?? Or maybe one of our wind generators on your garage roof-top...to charge your bike batteries! "Drive to Suvive" to promote Hydrogen as an alternative to imported fossil fuels. We tip our hat to this noble effort...but wonder what happened to the photo of one of our Charger bikes that once held a spot in their web site "Photo Gallery" (San Francisco Pit Stop)?? For that matter, NO PEDAL CYCLES FEATURED during this "forward thinking" publicity stint for sustainable transportation alternatives!...a drive occuring during BIKE TO WORK WEEK! We thought Dennis' assistant organizer was kidding when she said this drive was more of a "car thing"...discouraging us from being the spokes-folk for pedal cycles at the various pit stop podiums. 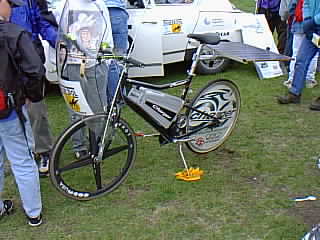 bike photo courtesy of "Autoholics Anonymous"
But why was the Charger bike photo taken off the 'Drive To Survive' Site? This doesn't make much sense, because NESEA (Northeast Sustainable Energy Association) was happy to auction a Charger bike at a fund raising event for their Sustainable Building Energy Conference a while back. 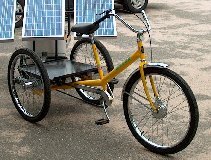 ...and "Dennis' Drive" was timed to end at the finish line of NESEA's "Tour de Sol" solar-vehicle race, May 14th, in Washington D.C. ODD...NO PEDAL CYCLES...?? The Charger WON the single passenger vehicle division of this same race soon after the bikes came out!! 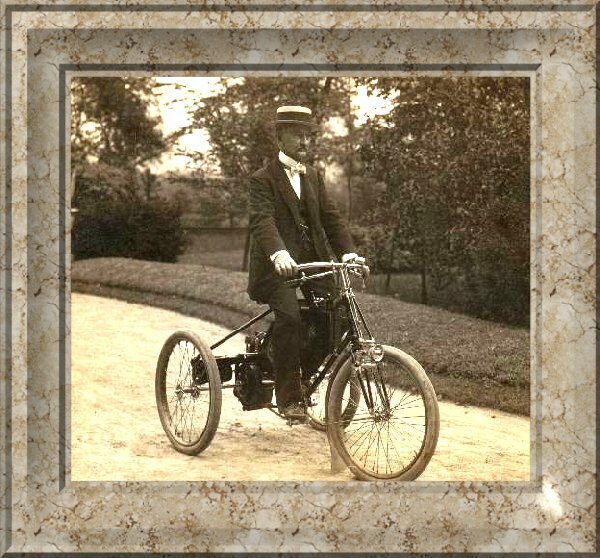 Could it be the Toyota and Honda car dealers* who donated cars for the journey wanted the bike with it's sign "E-Bikes Make Cents" removed? Maybe "Dennis' Drive" WAS just "a car thing" (and "SUV thing") ! If so...we advocate EVERY bicycle, trike, and quadracycle show up at EVERY alternative transportation rally. Human power "fuel" is equally important, if not more so than the stuff that makes us lazy! LET'S DISCOURAGE MORE CARS--WHICH REQUIRE MORE ORCHARDS TO BECOME PARKING LOTS! Besides...young people are especially attracted to pedal cycles, and our presence makes a lasting impression. San Francisco City & County Dept. of the Environment plans a series of public hearings on an imaginative "pilot" power plant...using tital power under the Golden Gate Bridge. No moving parts in a venturi flow design mean minimal havoc to underwater creatures... The potential power is several times that consumed by the city. * Foot-Note: After GM became a significant shareholder in the company who designed and made the electrical part of these "bionic" bikes...CHARGER, LLC ceased to exist. In the 1950's, after GM purchased the electric rail system in the Los Angeles area, it also ceased to exist ("not profitable"). This was a few years after the "Tucker" automobile failed, though in 1948 it was decades ahead of it's time. With a rear mounted horizontally opposed 8 cyclinder helicopter engine, this made for a safe front crumple zone and 30+ miles to the gallon... Tucker barely covered his obligations to complete 50 of these trail-blazers before going bankrupt. He died at an early age. (See the movie, "Tucker", produced by George Lucas, directed by Francis Ford Coppola). Is it "a car thing"? Some of us think so. And not just "a car thing", but "a gasoline and diesel powered car and bus thing". Why else would GM not put a transmission in their electric EV-1 car? The company helping them design it was smart enough to use a transmission on their bike, so why not in the car??? Unless, of course the EV-1 was meant to only get a weak 50 or so miles to the charge?? Wouldn't it be something if EVERYONE wanted an electric car? There would have to be a major change in manufacturing infrastructure, wouldn't there? SUPER SPECIALS for building products ordered before August '03. 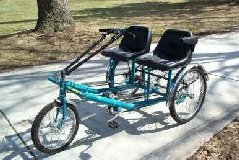 Call us for details on how to get a free Charger bike!